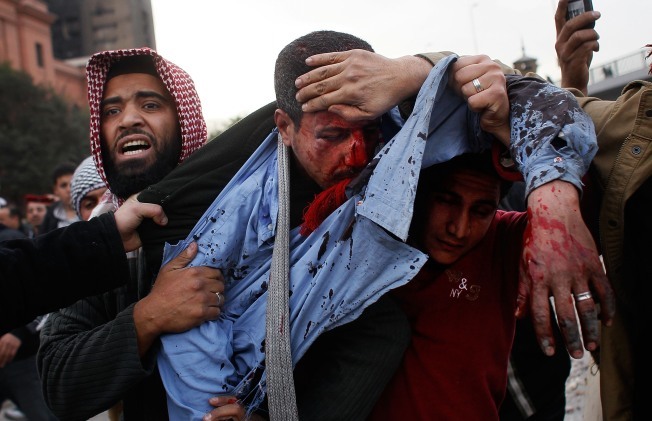 U.S. Woman Tells of Cairo's Descent Into "Hell"
A wounded anti-government protester is carried off after being struck by a rock during clashes with pro-government supporters near a highway overpass on the edge of Tahrir Square the afternoon of February 3, 2011 in Cairo, Egypt. American Lisa Roscoe took to the streets of Cairo this week waving an Egyptian flag to show her support for democracy protesters and a sign saying "Hi Mom" to get across the upbeat tone of the demonstrations. As supporters of President Hosni Mubarak begin moving into the square, Roscoe says she started getting "a lot of flak." A blonde-haired foreigner, she was an easy target for those looking to make a point about Western influence in Egypt. Her husband, Egyptian filmmaker Hany Eissa, begged her to go home, so Roscoe departed from the square on Wednesday. "I guess it all went to hell after I left," she told msnbc.com in a telephone interview Thursday afternoon from her home in the Cairo suburb of Maadi. Roscoe's husband, Eissa, stayed behind. "He will stay there until the bitter end. He will die for this cause ... what else can he do? He could never look himself in the face if he didn't do this," she said. Egypt's Health Ministry reported that 13 people have been killed and 1,200 injured in the clashes between pro- and anti-government demonstrators that occurred after she left the square. Eissa, 36, described the clashes to msnbc.com by phone. "Yesterday was horrific. You can say this was the worst day of my life," he said. He characterized the scene as one of happy, smiling protesters set upon "all of a sudden" by an angry mob of hired thugs. He said some who were captured by the protesters were carrying security forces' identity cards, a claim made by other protesters. Before training in Los Angeles to become a filmmaker, Eissa was a doctor, so he has been helping to treat the wounded in the square. He said he treated a man whose "face was filled with blood and dust. It was just horrific. I felt like I'm going to cry." Eissa also said he witnessed snipers on surrounding buildings fire into the crowd after darkness fell on Wednesday. "Imagine someone on the top of a building, aiming at someone that he never saw in his life. He doesn't know anything about him. All he knows is he aims and then pulls the trigger. Snap! The guy is dead," Eissa said. "Now probably his (the victim's) mother is weeping, his wife or his kids. Why would someone do something like that? It's more than evil," he said. He said Tahrir Square was "just a symbol," but the fact the protesters had managed to stay there meant a lot. "I feel like I belong to the best people in the world. Despite all of this, they couldn't capture the square," Eissa said. "Without liberty, life means nothing ... I'm going to go back and tomorrow is going to be a big day. We're going to continue for sure," he said. "I believe in God. I believe God will help us to win." Roscoe, 48, a political science graduate student at the American University in Cairo, said she would take Eissa's place "if something happens to my husband." "It started with such hope, not that I think it's ended ... there was such a wave of optimism and hope," she said. Those feelings had now been "tempered by sadness, frustration and anger," she added. She suggested the protest had become an all-or-nothing struggle. A helicopter had been flying around Tahrir Square, she said, taking pictures of the demonstrators in the square "because they are going to have a crackdown." "If the protesters stop, then I think a lot of people are in danger," Roscoe said, because security forces will seek them out. In fact, Roscoe fears she could be deported just for speaking to the media. "I'm trying to be a little bit careful because they are rounding up people. However, I am happy for you to use my name," she said. Roscoe was raised in San Francisco by parents she describes as "Beatniks, Bohemians and civil rights marchers." But the situation in Egypt has left her "really angry" with her native country for what she calls its failure to offer stronger support to the demonstrators. "I come from a country that stands on the moral high-ground of democracy and liberty and the only way they can uphold these principles is by supporting autocratic and oppressive regimes. The irony of that is just astounding to me," she said.